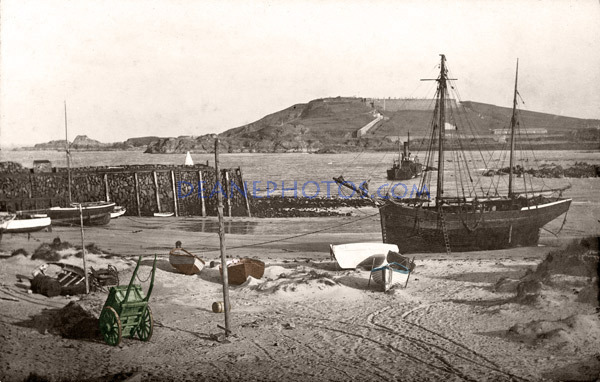 Thomas was taking photographs in all of the Channel Islands, and was helped with the printing by his wife and two of his children, Mary and Hamilton. This collection is quite extensive, so it will take some time to scan and complete. Documentation held, infers that at least 44 photos were taken in Alderney, there maybe more. If anyone has any photographs that they cannot identify due to a faded reference number and inscription, please contact me as I may be able to help. In most cases, there is a purple ink stamp on the back with " T. SINGLETON LANDSCAPE & GENERAL PHOTOGRAPHER GUERNSEY."